Gaithersburg, Maryland, USA - July 22, 2013- GL Communications Inc. announced today its enhanced PacketScan™ software, a comprehensive IP Analyzer for voice, video, fax, data, and signaling. Speaking to reporters, Mr. Jagdish Vadalia, Senior Manager for Product Development of the Company said, "All carriers are rolling out services, including voice, video, fax, and data via packet networks. There is need for a single tool that provides comprehensive analysis and monitoring capabilities – whether for VoIP, FoIP (Fax over IP), video, or wired and wireless traffic and signaling. Also, if such a tool provides Quality of Service (QoS) and centralized Network Surveillance Solutions with multiple Probe locations, thencustomers are afforded a one-stop solution for performance analysis of their IP networks." He added, "GL's PacketScan™ and PacketScanWeb™ have been enhanced to provide integrated and comprehensive All IP Network Analysis and Monitoring Solutions. 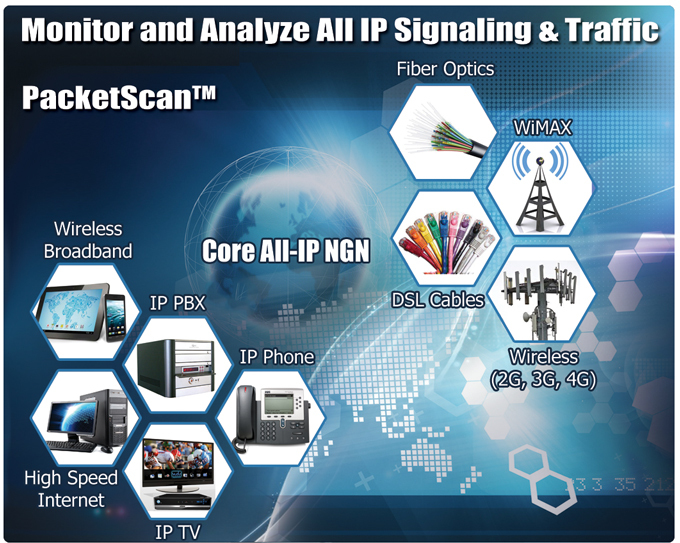 PacketScan™ is a powerful software tool that captures and monitors live signaling and traffic over IP (IPv4 and IPv6). It captures, segregates, monitors and collects statistics on all IP calls. Almost all protocols over IP transport layer for example: SIP, SIP-I, SIP-T, H323, MEGACO, MGCP, Diameter, LTE S1, X2, and eGTP and more can be captured and decoded for troubleshooting network problems." Mr. Vadalia further added, "Thousands of calls can be monitored in real-time including detailed analysis of selected voice band streams. Applications include testing of IP phones, Gateways, IP Routers, Switches, and Proxies. Users can listen/record audio and video data of a session in real-time; perform power, frequency, spectral, tone and digit analysis, and video analysis with ease and precision; and can get an exact picture of QoS (quality of the service)." The PacketScan™ is now an "All IP" protocol analyzer. It includes protocol decode support for all protocols transported over IP. Enhanced PacketScan™ architecture now permits monitoring up to 2000 simultaneous calls in core i7 machines. The application has enhanced call analysis capability using Microsoft® Excel® Addins. The custom Excel® addin can import PacketScan™ call summary reports (CSV format) and provides detailed graphs for any metrics such as LMOS, CMOS, R-Factor, Lost Frames etc. The PacketScan™ also offers enhanced HDL File Conversion Utility to convert ethereal (Wireshark) format files (*.PCAP, *.CAP, and *.PCAPNG) to GL's file format (*.HDL) and vice-versa. The utility can also automatically detect the format of the source PCAP files whether it is captured on Linux or Windows® and converts accordingly to HDL file. One can also generate reports of captured Calls Summary in PDF format in packet analysis. The statistics included in the report are: Calls per second, signaling frames count for each call, total timed out calls, total force closed calls, total discarded RTP packets, percentage value displayed for discarded, lost, out of order and duplicate packets, Call initiated time, Call established time. The enhanced application provides graphical presentation of analysis including ladder diagrams of protocols.